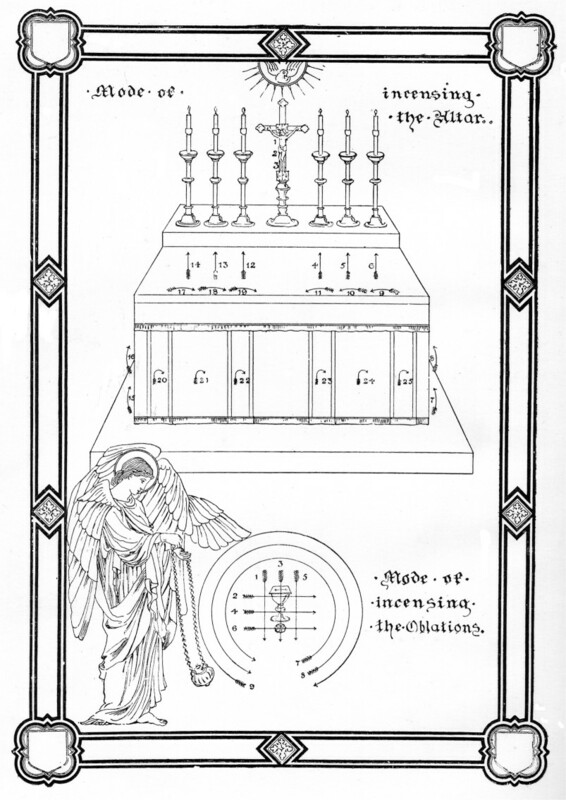 Welcome to the first of several installments of this blog series entitled "Novus Ordo Liturgical Compatibility with the Tridentine Mass". For those who would like to know, I am using a Daily Roman Missal published in the US by the Midwest Theological Forum with "Our Sunday Visitor". It has the mass in both Latin and English side by side. My commentary will be solely based on the assumption that you are celebrating ad orientem with the tabernacle behind or on the main altar! This is also assuming that the only ordinary minister present is a priest. If you have any questions pertaining to other combination of ordinary ministers, sanctuary orientations, etc., please email me. My email is in my biography under the tab "About Me". Note: The words I write in reference to what will be said at Holy Mass will be in English. It is obviously approved, and in tradition and according to the Second Vatican Council, preferable, if it is said in Latin. More on that topic at another time. Also note that, although this may not be in perfect conformity to Extraordinary Form, it is done with deepest love and, as much as possible, in conformity with the Extraordinary Form, so far as I could. The Entrance Chant (Introit, Hymn, etc.) starts. The altar boys process in first followed by the priest. The altar boys stop at the foot of the steps of the altar, leaving a space in the middle of their configuration for the priest to stand. If there are no steps, they stop a little distance away from the altar. The priest then joins the altar boys. All genuflect. The priest then ascends to the altar to kiss it. Then he descends back to the altar boys. The priest then takes the thurible from one of the altar boys, puts incense on the hot charcoals, blesses the incense, and then takes the thurible from the altar boy. The priest ascends to the altar while the altar boys stay in place. He bows. The priest incenses the altar (look at the picture I place at the end of this post about how to incense an altar properly). After incensing, he bows again. He then descends to where the altar boys, turns towards the altar, and hands back the thurible and then ascends back to the altar. The priest then re-ascends to the altar and genuflects, standing at the center of the altar. The thurifer (the one carrying the incense - might as well call him what he is at this point) then takes the thurible to it's designated spot. Note: All of this happens while the Entrance Chant is being sung! That is why it's important to sing ALL THE VERSES of a hymn! I'd advise the choir to sing the Introit of the mass in English and then a hymn for the congregation to sing with if there isn't enough time. So much has happened and the priest hasn't said anything yet. If there is no incense, the priest ascends to the altar, bows whilst kiss the altar, and stands at the center of the altar. The altar boys remain at the foot of the altar steps. Then the priests says either of these three greetings facing the people. It's rather informal to say really anything else and is not a part of the Roman Missal, 3rd Edition. 1. The grace of Our Lord Jesus Christ, and the love of God, and the communion of the Holy Spirit be with you all. 3. The Lord be with you. The priest then turn towards Christ holds a profound bow (bowing at the waist). The altar servers do the same at the foot of the altar. The Confiteor is then recited. Afterwards, the altar boys continue to hold the profound bow. The priest then, upright, turns towards the congregation, and while saying the general absolution, makes a Sign of the Cross over the people. The people should cross themselves whilst this is happening for it is Christ Himself who is giving them general absolution. After this, the priest then turns back towards Christ. At this point, the altar boys are standing upright again. When the Kyrie starts, the priest and the altar boys hold a simple bow (bowing with the neck). The Gloria is said or sung. Afterwards, the priest then moves to the right side of the altar, turns to the congregation and says, "Let us pray". He then turns back towards Christ. The Collect is then said or sung (This should be said in English, unless if by desire of the priest, it be said in Latin. In the Extraordinary Form, everything is in Latin). 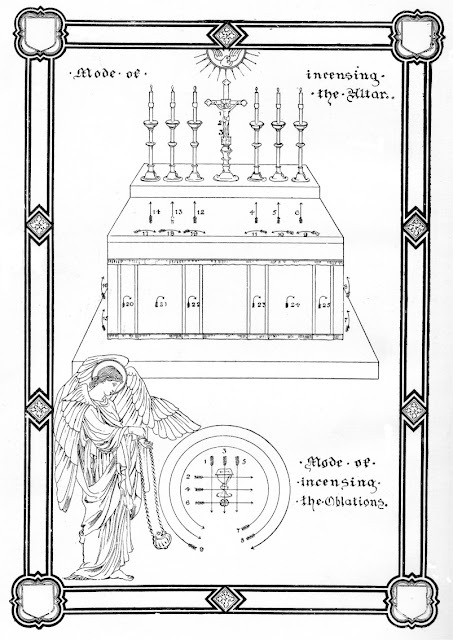 After the Collect is said or sung, the priest returns back to the altar boys, not crossing in front of the tabernacle. Everyone then genuflects and then go to the side of the sanctuary where the sedilla (in contemporary terms, the "priest's chair") and other benches are and sit. This is the end of the Introductory Rites. Here's the picture I promised. For incensing the altar during the Introductory Rites, you only use the top portion which depicts the altar. You use both depictions during the Offertory. The Novus Ordo Missae Rubrics state SPECIFICALLY that Mass is started at the Chair, rather than the altar. I have been looking for ways to get around this, but it isn't possible. Technically, and unfortunately, except Masses with more than one person, it is a Liturgical Abuse to start Mass at the altar, and disobedient to the rubrics. Another point that I would make is that after the confiteor, the Priest and servers should remain in a profound bow, turning towards the Altar Cross for the "Miseratur". This is what happened in the Tridentine Mass. The next prayer of the Tridentine Mass, the "Indulgentiam", was the prayer that the Priest made the sign of the cross over the people... and this prayer is absent from the Novus Ordo Missae.